So, my standard spiel when hand selling this title is "vegan journalist goes to interview an organic farmer, he cooks her a hamburger...and she never goes home". Not exactly the sequence of events, but close enough to grab your attention. Kristen and Mark embark on this farming adventure with youth, muscles, and few assets. Using age old implements, horses instead of tractors, manure instead of fertilizer, their goal is "to provide everything needed for a healthy and satisfying diet year round". From a “graceful, luminous writer with an eye for detail,” this riveting memoir explores a year on a sustainable farm—and the real world epitome of Michael Pollan’s food philosophy. "This book is the story of the two love affairs that interrupted the trajectory of my life: one with farming—that dirty, concupiscent art—and the other with a complicated and exasperating farmer." Single, thirtysomething, working as a writer in New York City, Kristin Kimball was living life as an adventure. But she was beginning to feel a sense of longing for a family and for home. When she interviewed a dynamic young farmer, her world changed. Kristin knew nothing about growing vegetables, let alone raising pigs and cattle and driving horses. But on an impulse, smitten, if not yet in love, she shed her city self and moved to five hundred acres near Lake Champlain to start a new farm with him. The Dirty Life is the captivating chronicle of their first year on Essex Farm, from the cold North Country winter through the following harvest season—complete with their wedding in the loft of the barn. Kimball and her husband had a plan: to grow everything needed to feed a community. It was an ambitious idea, a bit romantic, and it worked. Every Friday evening, all year round, a hundred people travel to Essex Farm to pick up their weekly share of the "whole diet"—beef, pork, chicken, milk, eggs, maple syrup, grains, flours, dried beans, herbs, fruits, and forty different vegetables—produced by the farm. The work is done by draft horses instead of tractors, and the fertility comes from compost. Kimball’s vivid descriptions of landscape, food, cooking—and marriage—are irresistible. 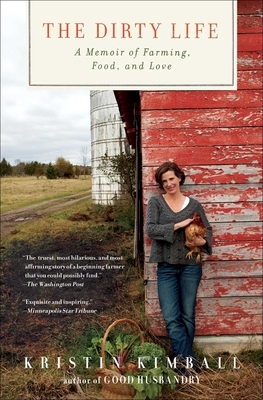 Kristin Kimball is a farmer and a writer living in northern New York. Prior to farming, Kimball worked as a freelance writer, writing teacher, and as an assistant to a literary agent in New York City. A graduate of Harvard University and the author of The Dirty Life and Good Husbandry, she and her husband Mark have run Essex Farm since 2003, where they live with their two daughters.